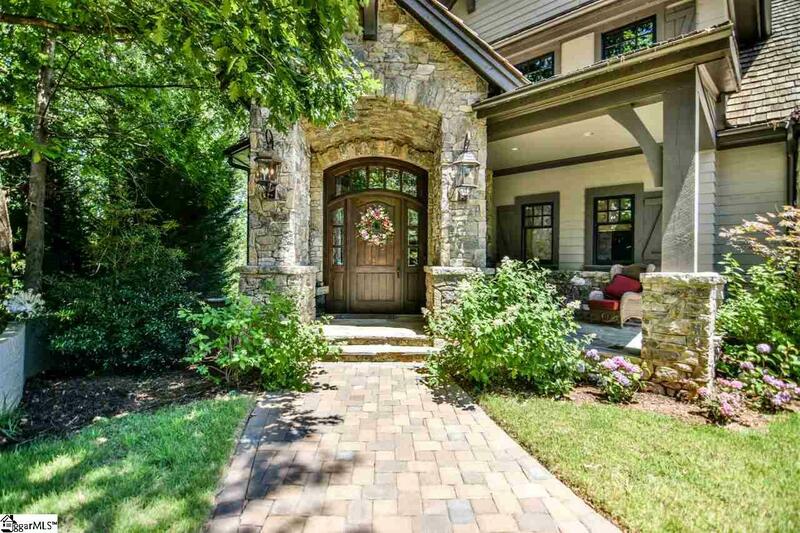 Welcome to 215 E Wynward Pointe Drive: Peace and tranquility infuse the atmosphere as you enter the private drive to this exquisite estate hidden away on Lake Keowee. Blended seamlessly into its natural environment, the estate stretches across the lot as if its been there for years and years with one of the best spectaclar mountain views on Lake Keowee. This architectural masterpiece, built by S D Hill Construction, is the personal home of the builder. Meticulously designed with an artisans eye for detail, the 8000+ sq ft residence captures the most prestigious views on Lake Keowee. Designed with 5 bedrooms, 6.5 baths, five car garage, and security cameras throughout, the home is detailed with Savant and Sonos systems. Set on nearly an acre, the lavishly landscaped grounds with auto sprinkler system follow a gently sloping waterfront lot to the ample shoreline. The property is enveloped by trees to maximize privacy. Large outdoor and covered living spaces feature luxurious decking. A spacious backyard with a multitude of options for entertaining includes a sitting area with fire pit and a summer kitchen. There is generous space to install a swimming pool and spa, if desired. Situated in a large, protected cove, the covered boat dock includes a 12,000 lb boat lift and is placed perfectly on the 370 shoreline to optimize your view of the lake. Prepare to be awestruck as you open the front door to the grand foyer revealing a picturesque view and a simply stunning backdrop - an open body of water, brilliant lake views and the cascading mountains. Beyond the impressive grand staircase, you are instantly drawn into the breathtaking views of the Blue Ridge Mountains and an expansive view of Lake Keowee like no other. The open concept living space is an entertainers dream with a large gourmet kitchen and butlers pantry to thrill the top chef in your family. The massive fireplace in the living area was built with each stone methodically placed to create a slight floor to ceiling curve to draw the eye up to the soaring wood beamed, vaulted ceiling. The main level veranda has an open space for dining al fresco, and features a retractable phantom screen area anchored with a large stone outdoor fireplace for entertaining or a quiet place to sit and read. The home features two master suites, one on the main level and the other on the mezzanine level. Both offer private, expansive Lake Keowee views. Ingenious design and large picture windows allow for natures art to be the focal point. The master en suite baths have oversized soaking tubs and walk-in showers for relaxation while taking in views of Lake Keowee. A large shiplap paneled office is conveniently located on the main floor and allows easy private access from the home. The mezzanine level features one master suite, two additional bedrooms, another home office and/or bedroom, while each level of the home offers a laundry room. There is allocated space on all three levels for an elevator if you choose to install. The lower level living space highlights a European style wood paneled bar for entertaining a large crowd in the open space for television viewing and billiards. The oversized ensuite bedroom allows for complete privacy while being conveniently located on the same level as the bunk room for children. The tiered level theater room accommodates a large crowd. Please visit the video for an online tour. Please note that a Cliffs Vineyard's lot could be purchased with this residence and a Cliff's Golf Membership purchased separtely at closing. Golf Membership allow you access to play any of the six additional Cliffs Communities golf course and the use of amenities each community offers. Listing provided courtesy of Kim Crowe of Joan Herlong Sotheby's Int'l.